At the same time, we have to recognise that for the Italians left in the boiling metropolises, because of the economic crisis, or for those who have used their few savings to have some relaxing days on our ever-busy beaches, the continuous assault of the vendors, often offering nothing more than junk, is stressful. The situation helps to form stereotypes and increase tensions on both sides. The Senegalese community is one of the largest immigrant communities in Italy numbering 85,000 legal and about 15,000 the illegal workers. The majority (around 80%) are men and only 20% are Senegalese women. Although there is recently an increase in the requests to move the family from Senegal to Italy, Senegalese people still dream to go back to their homeland (and being there, I understand why!). An overwhelming majority of Senegalese Muslims are part of the Murid brotherhood, a powerful African Sufi order, with its spiritual centre in Tuba. I have conducted research among the Senegalese community in Italy sporadically since 1998. I have spent time with them while they desperately tried to sell their often poor quality products, and I also witnessed the changes within the demographics of the community. I have witnessed first hand the hard life that they have to conduct in order to send to their family in Senegal 90% of what they have earned. In Senegal unemployment is very high and the country is suffering, as many of its neighbours, political and economic crises. Politics in Senegal have been marked in the last few years by both hopeful optimism and disillusions, often expressed through music. This has pushed many young people to look for a better life, or an escape from the intolerable misery that they and their family suffer, by migrating towards Europe, and in particular Italy, both as legal and increasingly as illegal migrants. Often the result is tragic, with many losing their lives to the sea and their family being left without support or hope. Nonetheless, it is not just politics or bad African economy and management which is creating one of the worst crises in Senegal. The European Union, and among them countries such as Spain, Italy, and Portugal, are responsible for the increasing hardship that the Senegalese people endure, the increase of illegal immigrants, as well as the death of many of them. To understand the dynamics, we need to know that one of the main dietary necessities for the Senegalese people, and one of the few proteins, is fish. Fish is essential to the survival of Senegal and its people. Until recently, fishing in Senegal was a rewarding experience and families could both sell their products at the markets and provide lunch and dinner for their own family with the classic dish of very piquant rice and fish. 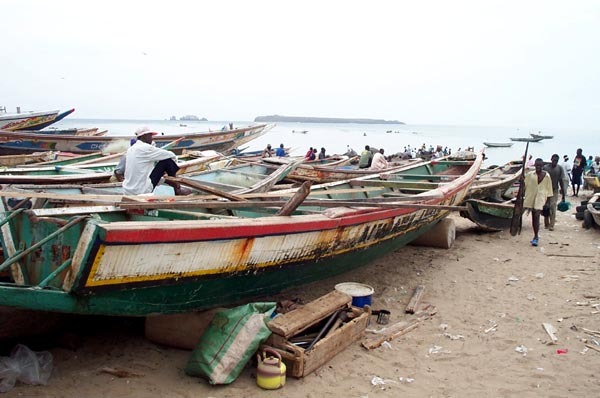 However, since the year 2000, Senegalese fishermen have noticed a drastic reduction in the number of fish available. The reason behind this depletion of fish stocks is that the Senegalese government has agreed with the European Union a deal in which large European trawlers are permitted to exploit Senegalese fishing resources with techniques and methodologies which are not even allowed in European waters. The result has been disastrous for the Senegalese people and in particular for the coastal villages. Some of the desperate fishermenhave even decided to use their small boats in a desperate attempt to reach Italy and sell whatever the Italian racket is ready to give them at the highest selling interest. The EU has serious fishing problems and the solution has been found in the worst of colonialist practices: exploiting Africa for its resources and starving its people, in this case the Senegalese people, the poorest of them. Hence, many of us, even without knowing it, are not only enjoying, maybe while relaxing in an Italian beach resort, the powerful and beautiful voice of the Senegalese Youssou N’Dour broadcasted by one of our local radio stations, as often happens in Italy, but also tasting Senegalese fish while, maybe, complaining about those annoying ‘vu cumprà’ with their tired and weary faces. None of the Italians with whom I have discussed this sad reality of the Senegalese people knew the truth at first. No one found the exploitation of the Senegalese sea justifiable. All of them understood that today we are in a globalised world and our actions in Senegal can only have consequences in Europe. Yet the same questions were asked of me: ‘Why is nobody telling us this story?’, ‘Why do they show us the many who reach our coasts but not the reasons for which they are ready to die while crossing the Mediterranean?’ The answer is simple: if states still need colonialism and colonial exploitation, a fully informed general public would condemn such actions. Very informative, this post, an eye-opener to many. I have foto´s on my blog (mainly about music and photography, it´s in Dutch), made a link to this post. I remember I saw a video-clip on Youtube in which a young singer/rapper from Senegal urges the youth not to flee to Europe but to stay and help to build their country. I forget the name of the artist-song, do you know it, or any of the readers of this blog? always such informative posts! I leave you with one of the beautiful lyrics of N’Dour, where he says “…I don’t wanna see you fade away Africa.” (No Mele). It would be interesting to read your thoughts on the social anthropology of African politics and particularly social politics.